If any of you are lucky enough to have a grandparent living with you, you can probably appreciate all the fun that comes along with having that extra hand. Mom, Nonna, is here until December 29, and I already feel sad thinking of her leaving so soon. I try not to think of it. She is so much fun to have around and can run circles around me. She’s not afraid to work and mom can cook up a storm without any effort at all. We are having a blast and I feel sorry for my siblings back East who are going to miss having her there for Christmas. On the other hand, it is I who have been deprived of my mom at Christmas for 26 years, so I think I deserve this very special year:) I’m glad God gave us family to share in all the good times; what a blessing. I hope you all appreciate your family and loved ones as well! 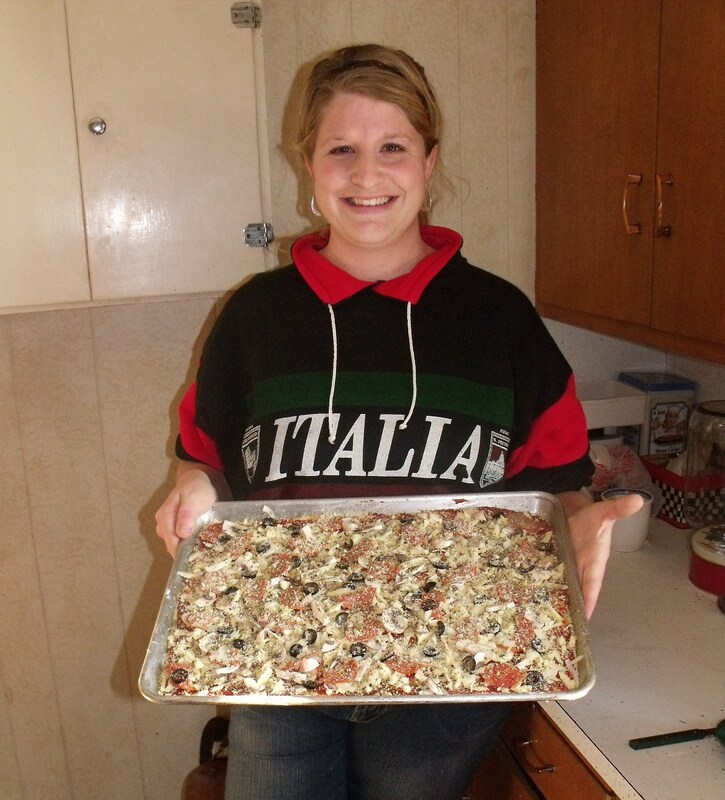 Below are the contestants of the fun pizza cookoff we held last weekend. It was a real eye opener seeing how competitive some of us were. I tried to butter up the judge with a hug and a kiss but that did not work in my favor. The judge was Fred who very carefully tested the four pizza’s and spoke highly of each one. He did not know before hand who made which pizza, so it was all fair. 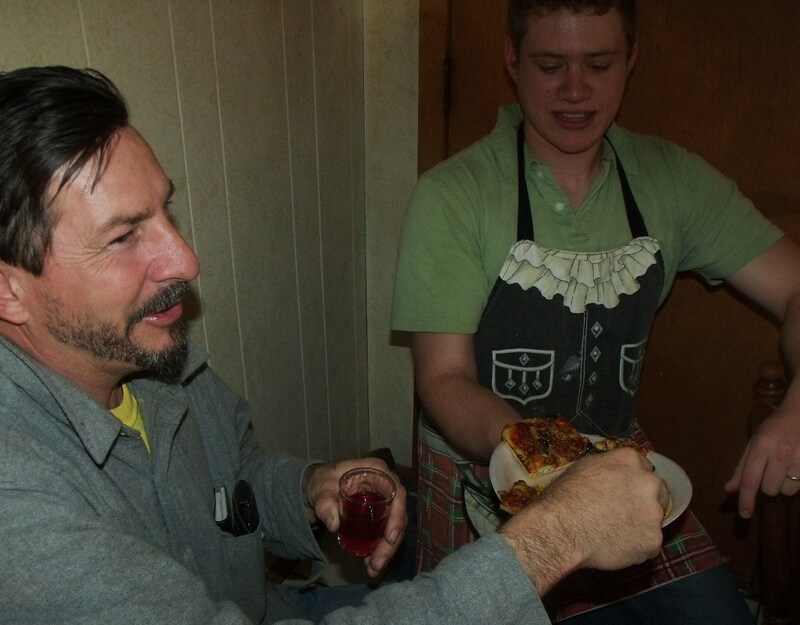 Fred, armed with a glass of vino, taste tested each pizza and gave us a run down on what was good and unique about each recipe. Frenchy’s crust, for example, was thick and puffy, with plenty of parmesan cheese, while Nonna and the twins pizza, topped with Stacker peppers was delicious, a brand new topping idea. My pizza had a good variety of veggies and Peters had just the right mixture of eggplant and pepperoni. In the end, Nonna and the twins won and they sure didn’t let us forget it:) Would it be fair to mention that Luke chose my pizza later? Or was he just buttering up his mother-in-law? I see a pattern here. Fred chose his mother-in-laws pizza while Luke chose mine. Hmmmm. It was fun and the food and wine was great. Below is a family photo of us at Thanksgiving with Nonna in the middle proudly displaying two of her four great-grandchildren. The two extra kids belong to my brother Joe, Vincent and Victoria Petruccelli. More family time together; we always seem to come up with something fun to do. 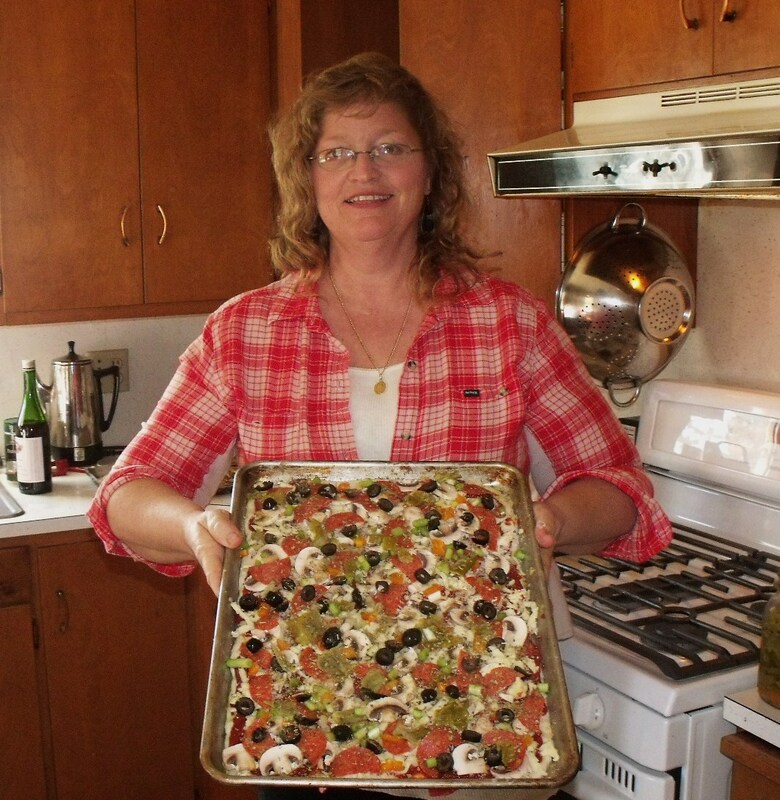 This entry was posted in FARM KITCHEN and tagged pizza cookoff, Sandra Petruccelli. Bookmark the permalink. I’m hungry!!!! Very good pizza some Italian pizza. Kisses at all! Look at you, Sandra!!! You have lost so much weight!!! You look fantastic! Ditto what Jackie said! You look AMAZING!! Wow, on the pizza. 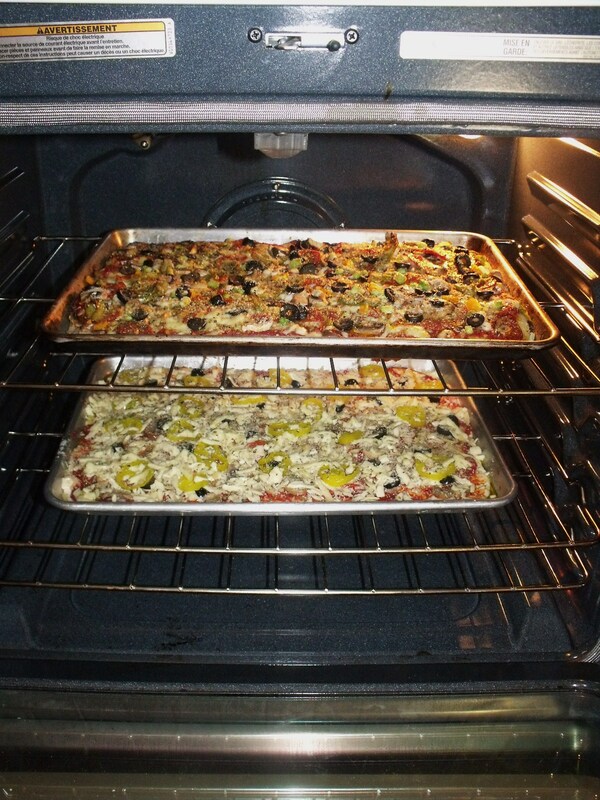 I am coming to your house for pizza night…. AHHHHH!!!!!! the pizza with the banana peppers gets my vote! MY FAVORITE! now give nonna back!!!!!!!!!!!!!!! xoxoxoxox miss & love you all! 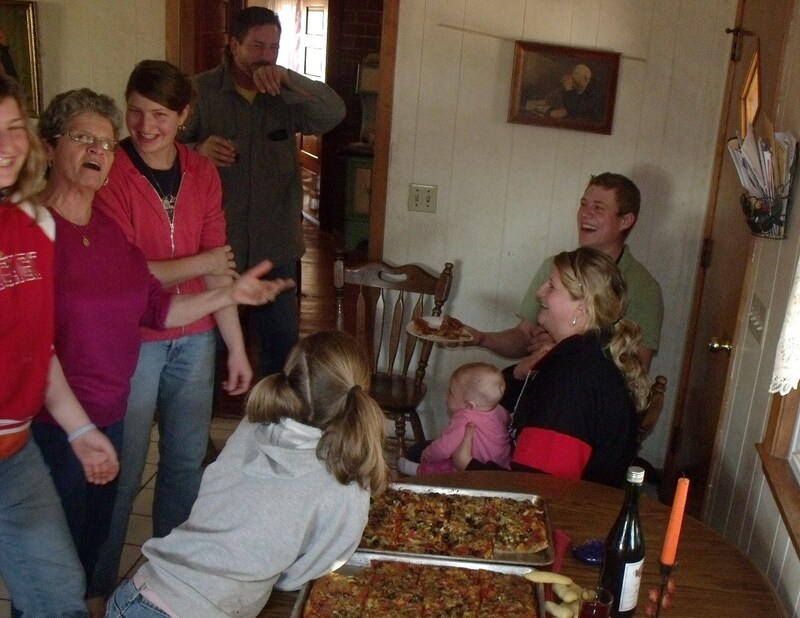 Uncle Tony and Aunt Lina bovi say, great job on the pizzas. They all look great, would have loved to have been there to taste them. Yum yum – how do I get to be a judge? I am just getting ready to descend into the vortex of Washington DC traffice – would the twins like to fly back here to accompany me on another drive like the one on the day the MLK Monument was dedicated during your recent visit? I will ask Uncle Gino to keep us company. I have been enjoying that honey you brought us mighty fine.